The Army Service Ribbon is one of the most common ribbons you will see worn by Army personnel. It is earned when a soldier successfully completes initial-entry training and if needed, their MOS-producing course of training. It is a ribbon that is earned only one time. It was established on April 10, 1981, by the Secretary of the Army. The Army Service Ribbon is a multi-colored rainbow ribbon, with the colors arranged from left to right: red, orange, yellow, green, blue, green, yellow, orange, red. The colors represent the complete range of military specialties officers and enlisted soldiers may go into upon conclusion of their initial training. Who Can Earn the Army Service Ribbon? The Army Service Ribbon can be earned by all members of the active Army, Army National Guard, and U.S. Army Reserve in an active Reserve status. The ASR is earned only once, no matter how many times a soldier completes initial entry training. For example, if a soldier completes enlisted training and then later completes officer training. What are the Criteria to be Awarded the Army Service Ribbon? Officers: After successfully completing their basic/orientation or higher level course an officer will be awarded the Army Service Ribbon. An officer who has a specialty or special skill identifier or MOS that is based on skills acquired in other services or in civilian life and therefore enters without attending a course is awarded the Army Service Ribbon after completing four months of active service honorably. Enlisted personnel are awarded the ribbon after successful completion of their initial MOS producing course. 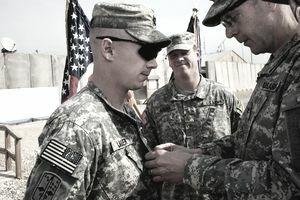 As with the officers, if an enlisted soldier does not need to attend an MOS producing course because he or she has the skills needed for his or her specialty, special skill identifier, or MOS, the Army Service Ribbon is awarded after completion of four months of honorable, active service. If a soldier died in the line of duty on or after August 1, 1981, prior to completing the required training or time in service, he or she may be awarded the Army Service Ribbon posthumously. The award was established in 1981 and there are some key dates that affect who could earn it during that time frame. The date of August 1, 1981, determines who earned the award and who can be awarded it retroactively. If you completed your required training prior to August 1, 1981 but you had an active Army status on or after that date, you can be awarded the Army Service Ribbon retroactively. Soldiers who completed the required training after August 1, 1981, have received the Army Service Ribbon if they fulfilled all of the other criteria. The Army Service Ribbon has a low order of precedence. It ranks above the Army Overseas Service Ribbon and below the Noncommissioned Officer Professional Development Ribbon. The equivalent awards in other armed services are the Air Force Training Ribbon and the Marine Corps Eagle, Globe, and Anchor emblem. When successfully completing a designated Noncommissioned Officer professional development course, the service member is awarded the Noncommissioned Officer's Professional Development Ribbon. A numeral is attached to the ribbon to show completion of specific levels of subsequent courses. The primary level course is signified by the basic ribbon; basic level course with the number 2; advanced level course with number 3; and senior level course (Sergeants Major Academy) with number 4.